Gridiron Publishers. Hardcover. 0932520642 Like New Condition. . Fine. Gridiron Publishers. Hardcover. 0932520642 New Condition. . New. Gridiron Publishers, 2002-07-01. Hardcover. Used:Good. 2000-06-04. Good. Ships with Tracking Number! INTERNATIONAL WORLDWIDE Shipping available. May not contain Access Codes or Supplements. May be ex-library. Shipping & Handling by region. Buy with confidence, excellent customer service! Rutledge Hill Pr, 1991-09-01. 6. Hardcover. Used:Good. 2002-01-02. Good. Ships with Tracking Number! INTERNATIONAL WORLDWIDE Shipping available. May not contain Access Codes or Supplements. May be ex-library. Shipping & Handling by region. Buy with confidence, excellent customer service! Gridiron Publishers, 2000-11-01. 7th. Hardcover. Used:Good. 1977-04-09. Good. Ships with Tracking Number! INTERNATIONAL WORLDWIDE Shipping available. May not contain Access Codes or Supplements. May be ex-library. Shipping & Handling by region. Buy with confidence, excellent customer service! Strode Publishers, 1977-01-01. Hardcover. Used:Good. Huntsville, Alabama: Strode Publishers, (1971), 1977. 1st Edition . Hardcover. Near Fine/Very Good. 8vo. 353 pages. Illustrated. Signed by the author on the front free end paper, not inscribed to anyone, signed, "Best Wishes - Bill Cromartie". Dust jacket protected in a new mylar sleeve, not price clipped. Dust jacket has very minor edge and corner wear. Book is very clean, square, and tight, no previous owner's names or marks except for a 1/2" light stain (coffee?) on the fore-edge. A complete history of the Georgia/Georgia Tech football rivalry covering every game from 1893 to 1976. Offical records and players names. A scarce signed first edition. Gridiron Publishers, 2000-11-01. Hardcover. Very Good. Signed. Signed and inscribed by author. Light wear to covers. Text clean and unmarked. The binding is tight and square. Light wear to the dust jacket. Your Satisfaction is guaranteed! Gridiron Pub. Hardcover. 0932520618 . New. 2000-11-01. 7th. Huntsville Alabama: The Strode Publisher, Inc., 1977. F/NF/1st ed. 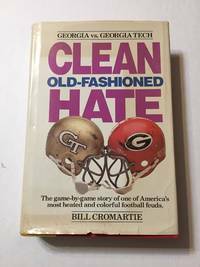 Clean Old-Fashioned Hate is a complete history of the Georgia-Georgia Tech football rivalry. This book covers every game from 1893 to 1976. The book also includes a never-before compiled offical records section and the names of the almost 2000 players who participated. First hand accounts of the games by former players and coaches, and loads of pictures. This is the scarce First Edition. 360 pages. Book is clean and tightly bound, with clean white unmarked pages. Dust jacket has one small chip at tip of front top corner, and some light general shelfwear, but has excellent vibrant color, and is a very attractive in a mylar sleeve.. First Edition. Hard Cover. Fine/Near Fine. Football Rivalry/GA-GA TECH. Gridiron Pub, 2000-08-01. Hardcover. Very Good. Nice looking book, has minor edge wear. Gift inscription inside front cover. Black and white illustrations. Very clean book. Gridiron Publishers. Used - Good. Shows some signs of wear, and may have some markings on the inside. Gridiron Pub, 2000. Hardcover. Very Good. Disclaimer:A copy that has been read, but remains in excellent condition. Pages are intact and are not marred by notes or highlighting, but may contain a neat previous owner name. The spine remains undamaged. At ThriftBooks, our motto is: Read More, Spend Less.Dust jacket quality is not guaranteed. Rutledge Hill Pr. Hardcover. GOOD. Spine creases, wear to binding and pages from reading. May contain limited notes, underlining or highlighting that does affect the text. Possible ex library copy, thatâll have the markings and stickers associated from the library. Accessories such as CD, codes, toys, may not be included. Gridiron Publishers, 2000-11. Hardcover. Very Good. Nelson Incorporated, Thomas, 1991. Hardcover. Acceptable. Disclaimer:A readable copy. All pages are intact, and the cover is intact. Pages can include considerable notes-in pen or highlighter-but the notes cannot obscure the text. Rutledge Hill Press, 1987. Hardcover. Good. Rutledge Hill Press, 1987-01-01. Hardcover. Acceptable. Book is in good to acceptable condition with minor blemishes on the dust cover, including a clipped corner on the inside. Pages are clean, but have tanning due to age. Ships next business day. Nelson Incorporated, Thomas, 1987. Hardcover. Acceptable. Disclaimer:A readable copy. All pages are intact, and the cover is intact. Pages can include considerable notes-in pen or highlighter-but the notes cannot obscure the text. Nashville: Rutledge Hill Press, 1987 1st ed. thus. 500pp. illus. hardback tall 8vo: near Fine in a near Very Good dj [dj = p-c; tear @ top edge of front fold; else nrVG] A nice copy of this popular history of the Georgia-Georgia Tech football rivalry that dates back to 1893. Edition: 1987 1st ed. thus. Rutledge Hill Pr, 1991-09. Hardcover. Good. Rutledge Hill Pr. Used - Good. Shows some signs of wear, and may have some markings on the inside. Rutledge Hill Pr. Used - Very Good. Great condition for a used book! Minimal wear. Nelson Incorporated, Thomas, 1991. Hardcover. Good. Disclaimer:A copy that has been read, but remains in clean condition. All pages are intact, and the cover is intact. The spine may show signs of wear. Pages can include limited notes and highlighting, and the copy can include previous owner inscriptions. The dust jacket is missing. At ThriftBooks, our motto is: Read More, Spend Less.